A few months ago, I posted on the desecration of tombstones at the Jewish cemetery in Botosani, Romania. I visited the cemetery last week as part of my (Candle)sticks on Stone project to document the representation of women in Jewish tombstone art in northern Romania's Bucovina region. The cemetery is vast, and though the newest section is well maintained (and still used by the small Jewish community) the rest of the cemetery is almost inpenetrable. It is in the newer section of the cemetery, just on the edge of the overgrown part, that the vandalism took place: a number of smashed and toppled stones still lie there. I had wanted to go back to Botosani because I had been so impressed by the distinctive carvings on the (men's) tombstones I had seen three years ago -- vigorous lions, stags and other animals carved in a style that was almost reminiscent of art deco! I had seen a number of these stones in a clearing, down a path from the newer section, and I wanted to see if the same artist/stone mason had also carved candlesticks on women's stones. This time I found the path, but in three years, weeds, brush, bushes and even saplings have grown up, once again hiding many of the stones that had so impressed me and making it very difficult to take pictures! Glad you enjoy the site. A few posts back I gave the email contact for a man in Botosani, Gustav Finkel, who does this. He is so knowledgeable when it comes to Judaic culture and life. Hello! This was forwarded to me by my cousin who is from Dorohoi. My grandmother, Rebecca Moscovitch (Grimberg) was born in Botosani along with her sisters, Brina or Brana and Renee. What can we do to assist in the re-building from the desecration and possibly pay someone to make the cemetery viewable? Also, I see your lecture series for the next year. Any plans to come to Florida or Los Angeles? thank you so much for sharing. As the author of National Geographic Jewish Heritage Travel: A Guide to Eastern Europe, I have roamed thousands of miles around Europe's historic Jewish heartland, bringing Jewish heritage to light for on-site explorers and armchair travelers alike. On this blog I will post photographs, links and personal experiences related to Jewish heritage sites and travel, particularly in the countries of east-central Europe. I'm an American writer, photographer, and public speaker long based in Europe. 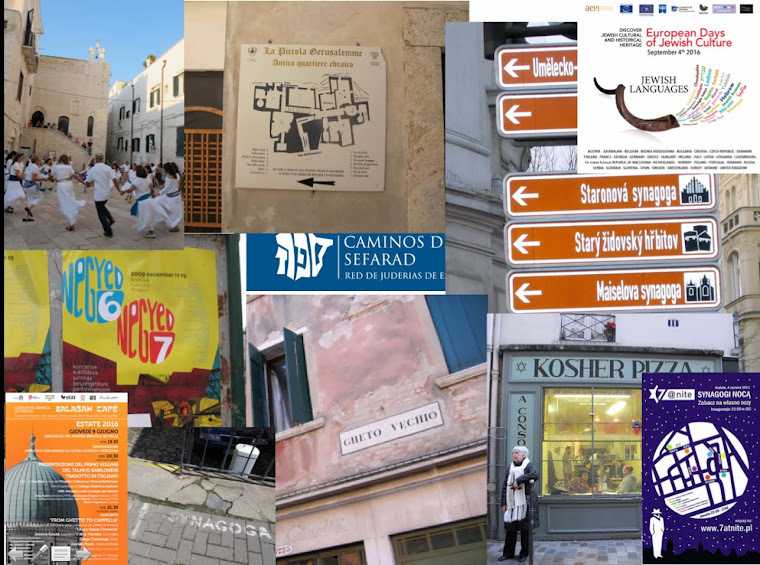 I've chronicled Jewish cultural developments and other contemporary European Jewish issues for more than 20 years and currently coordinate the web site www.jewish-heritage-europe.eu. 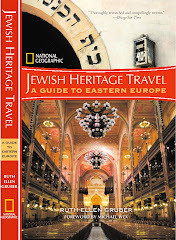 My latest books are "National Geographic Jewish Heritage Travel: A Guide to Eastern Europe," published in 2007, and "Letters from Europe (and Elsewhere)," published in 2008. I also am working on "Sturm, Twang and Sauerkraut Cowboys: Imaginary Wild Wests in Contemporary Europe," an exploration of the American West in the European imagination for which I won a 2006 Guggenheim Fellowship and an NEH summer stipend grant. In 2015 I was the Distinguished Visiting Chair in Jewish Studies at the College of Charleston, SC. I am available for writing and editing assignments, to give lectures and presentations, and to consult on travel and heritage issues. Please click HERE for further details. June 30, 2018, 12:00 noon -- Latke versus Hamentashen debate, JCC Krakow (during the Jewish Culture Festival). Defending the Latke. September 5, 2018, 10:00 -- Then, Then, and Now: Reconsidering Marvin Lowenthal's 1933 Jewish Guidebook "A World Passed By". Urban Jewish Heritage Conference, Krakow. Shana Tova -- Happy New Year! Going to Europe, stop at Vienna? G-dcast Psalm Project is looking for you!